“The man is only half himself, the other half is his expression.” ~ Ralph Waldo Emerson. I truly believe that quote. If we do not express ourselves, we are not complete. I exist for my art, my writing, as much as it exists for me. If you have not read any of my writing, then you can not truly know me. In fact, sometimes I feel I am more honest, more alive, in my writing than in reality. I want to share that poetic, whimsical side with you. 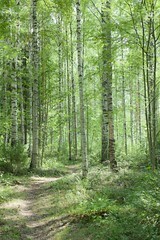 So run with me through a forest of birch trees, while butterflies and fairies dance around us. As I am the first in our rotation, here’s what you can expect from our schedule. The six of us will be blogging in rotation, in the order of our introductions, on alternating weeks.